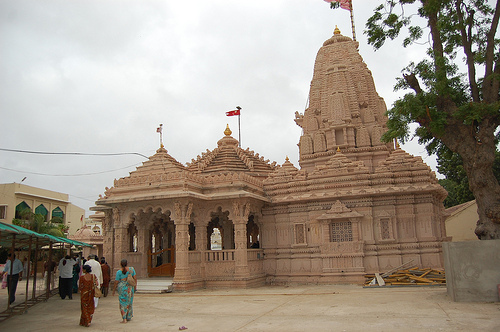 Mata no Madh is name of the place, where the famous temple of Ashapura Mata, the head deity of Kutch and kuldevi ofJadeja rulers stands. It is located about 80 km from Bhuj, the capital of erstwhile Princely State of Cutch and now headquarters of Kutch District in Gujarat State of India. The temple was built in the 14th century by two Karad Vanias, Ajo and Anagor. They were the ministers in the court of the father of Lakho Fulani. The earthquake in 1819 damaged the temple. Within 5 years Sundarji Shivji and Vallabhaji, twoBrahmakshatriya persons repaired it.The Mistris of Kutch were the artisans and architects, who did the renovation.This ancient temple is now 58 ft. long, 32 ft. wide and 52 ft. tall. Once again the earthquake of 2001 AD shook it and its dome tumbled down. However, very soon it was repaired once again and now it stands with a new grandeur. Mata no Madh is only 140 kms away from Kutch Resort.